I got it! The new camera. My old one was was giving me problems (lens wouldn’t focus, shutter button wouldn’t work sometimes). 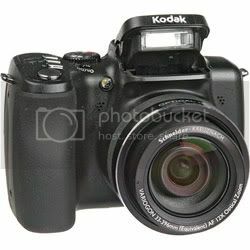 I need a reliable camera for my travel blogging, and I chose the Kodak EasyShare z1012. It is so NEAT! I got it at Buy.com, from a third-party seller there (Buy.com sells brand-new stuff, but they also allow other small businesses to sell their products at the site, too). It makes for a huge variety of products and deals at Buy.com. I got the camera for a phenomenal price, too. Isn’t it gorgeous?! I love love love the battery options. I was spending a small fortune in batteries with my little Canon Powershot, because it took only AA batteries. Not so with the Kodak camera! I LOVE THIS! It takes AA batteries, or CRV-3 disposable batteries, or CRV-3 rechargeable batteries. Hurray! I can’t tell you how important this is to me. The CRV-3 disposable batteries are not expensive, either– I got Energizer brand batteries ($10 for 2) and ordered some rechargeable CRV-3s with a Kodak battery charger. The CRV-3 are excellent batteries. Two of them lasted me several months with my previous Kodak. I’m very, very impressed with the camera, and Buy.com. They have a weekly sale page with good stuff at deep discounts. Definitely bookmark it so you can check it out weekly.